View of part of the brick pavement in the governor’s residence. 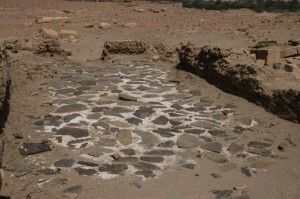 Different types of floor coatings, layers and pavements are well known from the southern part of the Pharaonic town of Sai examined by Michel Azim in the 1970ties. For example, the central room of the so-called governor’s residence has a splendid and very nicely preserved brick pavement. Some of the magazines show schist floors of which large pieces are still in place, together with a thick layer of gypsum. Similar schist floors have been recently excavated at Amara West, also within the context of storage rooms in the Rameside town. Magazine with schist floor still in place. 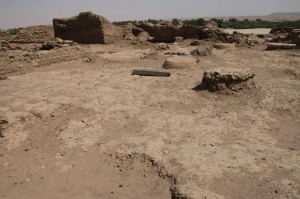 At Sai, SAV1 East with its large building complex, Building A, resembles in some aspects the southern part of the town and especially the area of the governor’s residence. During excavation in 2014 a large amount of schist fragments were found (according to our geologist, Erich Draganits, the correct term for this type of stone is amphibolite). Very often these fragments are still coated with gypsum/plaster – direct evidence that they have been used to cover parts of a building, most likely the floor. 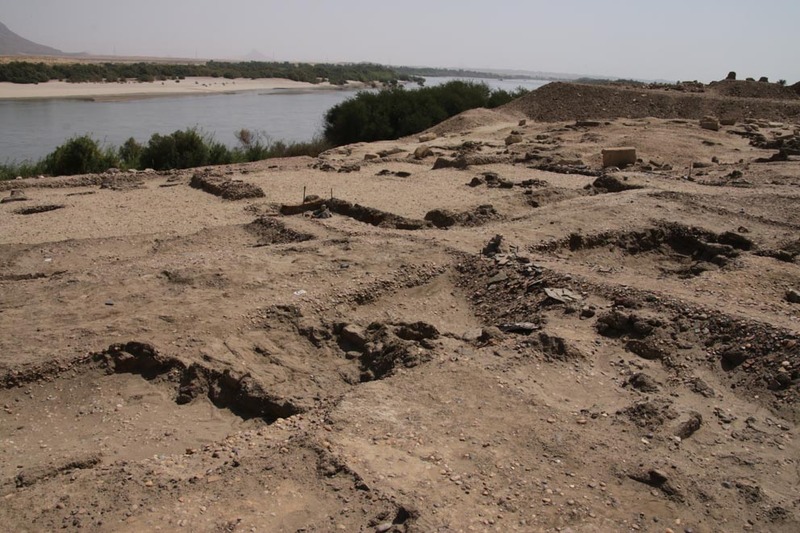 The schist fragments came to light from both, directly below the modern surface above remains of mud floors and, in larger numbers, from fillings of large pits cutting into the New Kingdom structures. It is therefore likely that a former schist pavement has been destroyed in antiquity and the plates were broken and dislocated. Overview of southern half of Square 3 – note the schist fragments in the southern baulk, within the filling of pit 46. All in all, 330 fragments were recovered from the western edge of Square 3 and Square 4 at SAV1 East. 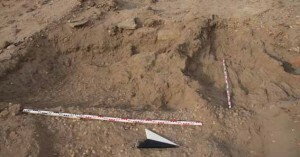 They would cover an area of approximately 3 square meters (not calculating spaces between the individual plates), indicating that either just a small area of the entrance rooms of Building A was equipped with this special paving or that much has been lost and we only found a very small percentage. 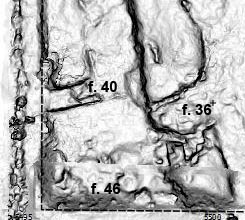 The first interpretation seems more likely as actually 3 square meters fit perfectly to the area where the highest concentration of schist fragments was discovered: between feature 40, a small interior wall running East-West, and feature 36, the main North-South wall in Squares 3 and 4, running parallel to the Eastern side of Building A as exposed in 2013. Southwestern corner of Square 3: between features 40, 36 and 46 the highest concentration of schist plates was found (Digital surface model: M. Fera 2014). Some mud pavement remains have also survived – maybe they originally were the lower bedding for the schist plates; towards the south, pit 46 cuts off the New Kingdom remains. Even if Building A has been badly damaged and its present state of preservation is largely restricted to the foundations, the elaborate schist floor somewhere in the western part of the structure underlines its high quality of building technique and important status comparable to the governor’s residence.